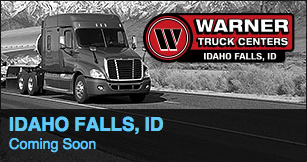 Warner Truck Centers of Salt Lake City, is moving forward on an $8 million Freightliner Truck dealership in Bonneville County, on 12.73 acres of land near Interstate 15 Exit 113. The plans, filed in late July, call for a 55,106-square-foot truck sales and repair area, with a 10,000-square-foot mezzanine. It project is located at the corner of 65th South and Doug Andrus Drive. The contractor on the project is Zwick Construction of Midvale, Utah. The company has been in operation since 1983. The Idaho Falls dealership will be its fifth. Its other Idaho dealership is in Jerome and another is planned for Caldwell. In Utah, the company is in Salt Lake, Salina and Hurricane. Overall, it employs close to 480 people. As a certified Freightliner, Western Star, and Sterling dealership the company provides parts and service for both heavy and light duty vehicles, body and paint work and fleet management. For more about the company, follow this link to a 2013 story that ran in the Salt Lake Tribune: Utah's Warner Truck Center keeps the big rigs moving.